The higher you live in a condominium, the stronger the wind will be during a storm. So if your condo has a balcony, patio or lanai, clear it of loose items. “Things that are being dislodged at height from a building will become wind borne debris missiles that can strike other portions of your building or the neighboring building or come down on the ground or smash into cars or potentially hit a person,” structural engineer Gary Chock said. Buildings built after 1996 will withstand stronger winds. Still, you should close your shades or blinds to stop flying glass. And tape over areas where wind and rain have entered your unit in the past. “If you have louvers you can do some taping between the stats to try to prevent or limit the amount of water that can come into you unit,” Chock said. Fill your bathtub with water in case the power goes out, and unplug electronics that can get damaged during a power surge. “If you’re in a building that has walkways that connect the building to a parking garage, those can become wind tunnels too. So avoid those during the storm,” Associa Hawaii’s Andrew Fortin said. Condos have insurance that covers structural damage. Tenants have renter’s insurance. “If I’m an owner I’ll have what’s a called an HO-6 policy that covers the contents of my unit,” Fortin said. He recommends notifying your building manager immediately if the storm damages your windows or lanai. Chock said because of how storm winds circulate around high rises you can expect to feel stronger wind if your unit is located in the corner of your building. Fortin said people who live in condos should be ready to help neighbors who are senior citizens or who have mobility issues. HONOLULU (HawaiiNewsNow) –Tropical Storm Olivia made a rare double landfall over west Maui and then Lanai on Wednesday, triggering torrential rains in some areas, bringing down trees, closing roads and causing power outages. About 2,000 customers were without power in Upcountry Maui, while 100 had lost power in parts of Molokai, officials said. A flash flood warning has been issued for Maui and Molokai into the afternoon. Meanwhile, a tropical storm warning was dropped for the Big Island early Wednesday, but it remains in effect for Oahu and Maui County. The warning was also canceled late Tuesday for Kauai County. There were also thousands of customers without power on Oahu, which is under a flood advisory through 3:15 p.m. The good news: As the day progresses, Olivia continues to weaken. About 2 p.m., Olivia barely remained a tropical storm — with winds of 40 mph — as it moved westward at 20 mph. The storm was 45 miles south of Honolulu, and tropical-storm-force winds were extending up to 90 miles from its center. But in a news conference Wednesday afternoon, the governor warned that while Olivia’s center has passed the island chain, the danger isn’t over. Bands of moisture behind the storm were expected to move over Maui on Wednesday afternoon and Oahu through Thursday. And that could mean the potential for flooding isn’t over. The Central Pacific Hurricane Center said Olivia’s center first came onshore near Kahakuloa on Maui’s windward coast about 9:10 a.m. Then, about 40 minutes later, the center made a second landfall on the northeast coast of Lanai about six miles north-northeast of Lanai City. Olivia is the first tropical cyclone to make landfall on Maui in modern history, National Weather Service forecasters said. On Wednesday afternoon, Maui Mayor Alan Arakawa urged residents and visitors to stay indoors and off the roads until the danger from the storm passed. “Stay home. Stay off the roadways as much as possible until Olivia passes,” Arakawa said, at a news conference Wednesday afternoon. Early Wednesday, Lanai Airport saw gusting winds to 47 mph. And on Oahu, some spots saw sustained winds to 33 mph with gusts to 41 mph. There were also isolated areas of drenching rains, though the showers appeared to be moving quickly. Over the 24 hours ending at 11 a.m. Wednesday, West Wailuaiki in Maui saw nearly 8 inches of rain, while Hana Airport got 2.8 inches. While Olivia has weakened significantly over the last 24 hours, forecasters continue to warn that the storm could trigger flooding rains, damaging winds and high surf. A high surf warning remains up for east-facing shores of the Big Island, Maui County and Oahu. On Wednesday, President Trump approved a presidential disaster declaration for any damages associated with Tropical Storm Olivia. Gov. David Ige said he spoke to Vice President Mike Pence, who said federal resources would be available to Hawaii if needed. An emergency proclamation has also been issued for Maui. The state closed all public schools in Maui County on Wednesday and urged non-essential government employees to stay home. Olivia was the ninth hurricane to form in the Eastern Pacific region this season, and comes on the heels of Hurricane Lane, which dropped record-breaking rain on the Big Island, whipped up wildfires on Maui and triggered widespread flooding on Kauai. Hurriedly built during the World War II era, the Navy’s underground fuel storage facility at Red Hill includes 20 fuel tanks situated just 100 feet above an aquifer that supplies drinking water to some 400,000 residents, from Moanalua to Hawaii Kai. Worry about the aging facility’s potential to taint water quality rightly spiked in the aftermath of a 27,000-gallon leak in January 2014. Subsequently, the Navy entered into an agreement with the U.S. Environmental Protection Agency and the state Health Department that tasked it with sizing up upgrades needed to improve safety. Changes much closer to maximal, including a shredding of the status quo, are needed. Honolulu’s Board of Water Supply warns if the Red Hill tanks — each large enough to swallow Aloha Tower — leak jet fuel that pollutes the nearby drinking water source, studies indicate that the result could be ruinous — cleanup could take decades or be cost prohibitive. For the sake of responsibly protecting groundwater quality and quantity, regulators should insist that the Navy install a more expensive — and clearly more effective — option of double-wall protection, which the BWS recommends. 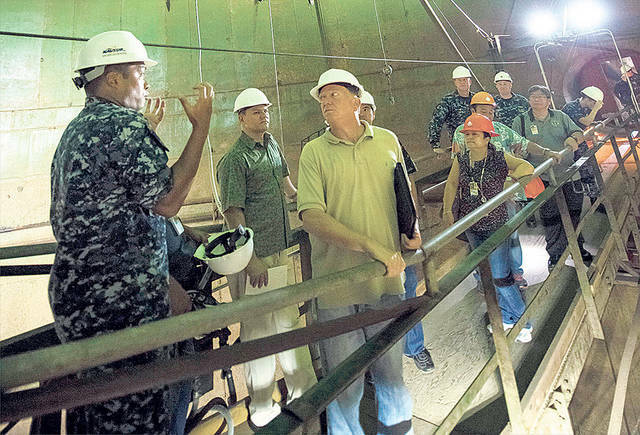 The Navy’s low-level recommendation calls for coating tank lower domes to prevent corrosion — already a current practice for Red Hill tank repairs — as well as coating tank nozzles at a price tag of $10 million to $25 million per tank. The option would also fund leak detection system improvements. The double wall, or tank-within-a-tank pick, could cost between $100 million to $250 million per tank, according to Navy estimates. The Navy has said it’s “seeking the best practicable options” as a steward of our tax dollars. That’s an eyebrow-raising take, given that just last month President Donald Trump signed off on a $716 billion defense budget for fiscal year 2019, which dramatically ramps up Pentagon spending. The president has touted the move as an effort to “strengthen our military like never ever before,” with a lineup of the “finest planes and ships and tanks and missiles anywhere on earth.” The hardware shopping list includes $7.6 billion for 77 F-35 Joint Strike Fighter jets, for example. Such spending, though, should also take care to thoroughly address long-standing military-caused environmental threats. In Red Hill’s case, BWS chief Ernest Lau points out that settling for the Navy’s proposed fix means “you are still living with … 1940s vintage, quarter-inch steel plate that is keeping the fuel from leaking out, and we know the steel is corroding on the back side.” Honolulu deserves much better than an apparent Band-Aid. The state Health Department recently extended the Navy’s deadline for making a formal recommendation to the end of the year so that additional studies can be completed. Also, last month officials told regulators that a Navy review of fuel requirements in the Indo-Pacific region is now in the works. Even so, no more foot-dragging should be tolerated. There’s virtually no doubt that the Oahu-based U.S. Pacific Command will continue to figure prominently in the Navy’s future. In late May, it was renamed U.S. Indo-Pacific Command, reflecting surfacing priorities, including competition with China and the growing importance of the Indian Ocean and India itself to U.S. strategy in the region. In addition to investing in next-generation military hardware, Navy leaders are also examining the inventory of ships and infrastructure to support them in the Pacific. In its assessment of the Red Hill fuel facility, to safeguard water quality and public safety, the Navy must put in place robust secondary containment — or calls for closure will mount.